Attitudes to Cromwell shifted radically during the 19th century. The case for public images of Cromwell was first considered as a question of historical accuracy. If a sequence of Kings and Queens of England were to be created, should Cromwell be included or not? The public acceptance of Cromwell as a major historical figure, of equal value to a monarch, grew steadily throughout the century. This view was particularly held by the Free Church movement, who regarded Cromwell as a national hero. After a disastrous fire the Palace of Westminster was rebuilt in the 1840's. A proposal that a statue of Cromwell should be included in the new decoration failed to secure sufficient support. The subject was debated in the correspondence columns of The Times in the early autumn of 1845, with a majority of letters in favour, but to no avail. 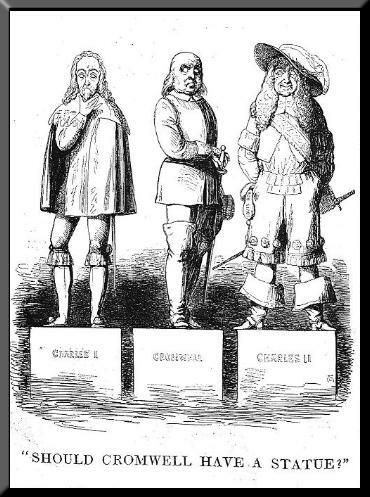 Punch magazine satirised the absurdity of the debate as to whether or not Cromwell should have a statue at Westminster in 1845. It reasoned that if Cromwell were to be excluded history books would have to be re-written proving that Charles Stuart died comfortably in bed!